As the seasons change across America, a lot of change comes about in our daily lives as well. For example, you might need to mow the lawn during the summer or shovel the driveway in the winter, but not the other way around. Different regions across the United States have varying climates, which bring with them special responsibilities for the residents of those regions. There are more tropical storms in Florida, earthquakes in California and blizzards in Alaska. However, most states in America, especially in the Midwest, North and Northeast, have unique preparations that must be made leading up to the winter months. Keeping your home safe and protected from the elements is a good idea no matter who you are, or where you live. This article will help you to determine your needs for this winter home preparation, and learn how you can take these preventative steps to keep your home and family safe. Why might you need to prepare a home for winter? The winter months can bring with them plenty of harsh conditions that can wreak havoc on your home if you are not careful. In many parts of the country where there is a reliable chance of snowfall, December, January and February can be the most likely times for a snow or cold-related incident to occur in your home. We all enjoy staying inside on a cold winter night, and often take for granted the amenities that help us to stay warm, like a heating system or fireplace. If you choose to neglect these features of your home, you may be in for a rude awakening once the cold fronts move in. Just because your furnace worked perfectly fine last year, it does not necessarily mean that it will work just as well this year. These intricate parts of our homes can be prone to deteriorating over time, and need regular maintenance to ensure that they are working at their top performance. If you wait until there is a problem to act, it could take longer than you may like to fix. Additionally, waiting until trained heating and cooling professionals are busy with other projects to call for help can come with higher fees. Cleaning your gutters before they freeze. Keeping leaves and debris in your gutters can prevent water and snow from properly travelling along them and being safely deposited. This can not only lead to flooded basements, but also damaged roofs. Getting your pipes checked. When the temperatures drop, the risk of your water lines bursting rises exponentially. Even if they are inside your home, pipes have the risk of bursting when any part of them is exposed to extreme temperatures. This can lead to flooding damage, fees and a lot of headaches. Making sure you have firewood ready. Many houses with heating systems also have a fireplace or wood-burning stove. Even if you use the heater 24/7, you should always be ready in the event that the heater stops working. Not having at least some firewood stored away can be a painful thing when you are freezing and waiting for the repair technician. Getting your chimney swept. If there is a chance that you are going to use your fireplace and have not in a while,you must get it cleaned by a professional. Failing to do this can lead to serious problems with the smoke of the fire not exiting your home, burning ash problems and more. Going out in a major snowstorm. Keeping your doors or windows open while the heater is running. Ignoring any dead trees or large branches that may impact your home if they were to fall. Not checking for drafts that might exist in your home, letting valuable heat out and the cold outside air in. This can also affect your energy bills. How can I know if my home is ready for winter? The importance of making a personal checklist, and sticking to it. 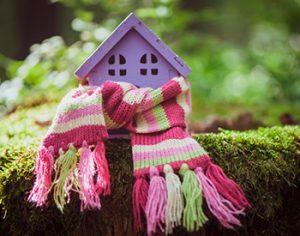 Many homeowners go into the winter months “winging it,” which can be very costly in the inevitable chance that they forget something. Mark your calendars ahead of time every year for specific dates to have things prepared and checked off your list. Having your furnace and pipes checked on a regular basis. To be sure that your furnace is ready to go, nobody will know better than a technician. You should usually get these consultations every one to three months while your system is in use, to change out any dirty or faulty filters. Having backup plans, and additional backup plans for those. It is one of the worst feelings to be left in the cold without help due to busy technicians. Not only is a wood-burning stove a good idea to have just in case, but consider getting a backup power generator. It won’t be able to power everything, but it could save you a lot of stress in the event of a big storm and power outage. With the right preparation, you can feel confident in your house’s ability to take you into the springtime safe and warm.